Ruler measurements will be beneficial to card making and any other craft project you do! 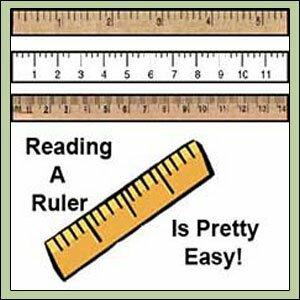 Learning how to read a ruler may not be like what you remember from elementary or high school, because I'm pretty sure we all were taught what all the little marks on a ruler stood for, but there for a while...? I couldn't remember one notch from another! "The trick here is to understand what each little mark stands for on a ruler." Here is a quick little Ruler Measurements Reading video I found on youtube. I think it might help you if you are having a great deal of trouble understanding. Enjoy! 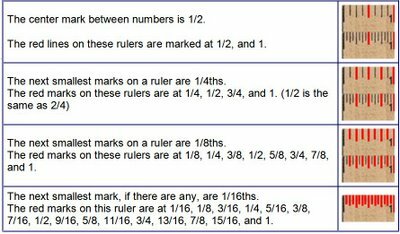 How to understand reading a ruler and ruler measurements and what all those marks on the ruler are all about is just a matter of going over the material again. 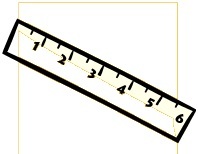 Once you realize that all the marks on the ruler means something different you will be measuring with the best of them! Then you can learn about paper sizes! Oh-The fun of it all! Ruler-Measurements are easy! Ruler Measurements: Kids can start by measuring themselves! This is a very easy way to start a child with Ruler Measurements- What better way than measuring themselves? All you have to do is put up the cutest measuring tool there is and have your child not just measure themselves, but show each and every time the growth... then explain the ruler measurements as you go. Brilliant! 1. Each foot is broken down into twelve inches and most regular rulers are about one foot or twelve inches long. 2. The problem for most people is the little lines between the inch marks! We all know where the 1, 2, 3 etc. inch marks are located, but we don't know what the marks between the 1 inch mark and the 2 inch mark mean or what they stand for. 3. The longer the line, the larger the measurement: See how the inch mark is longer than the half inch mark? And, the half inch mark is longer than the 1/4 inch mark (see chart below). Once we see the differences in the actual marks themselves we can then remember the numbers. This diagram is worth printing out and learning! 4. The smallest unit of measurement is 1/16 of an inch. When you look at a ruler and count all the lines between the 1 inch and 2 inch marks you will see that there are 16 lines all together. Because as Americans (and for the life of me I don't know why!!!) we express fractional numbers in the largest unit possible and we call it one inch. If you have 8 lines, or 8/16 of an inch you have a half-inch or ½ of an inch. And, if you have 4 little lines, or 4/16" you have a quarter inch. See how this works? In the begining, learning to read a ruler and Ruler Measurements will be a little tedious to count every little line, but in the long run you will not have to count them because eventually you will learn ruler measurements by heart. If you have the desire to learn more here is additional information! Tip: You could mark your ruler until you know the marks. Here is a great resource if you need Ruler Measurements right on you computer screen! Now that you have learned Ruler Measurements you can move on to Paper-Sizes.